The sprawling shelter is a former Walmart Super Center and was opened in March 2017 by Southwest Key, a Texas nonprofit. For the past several weeks, we've been reporting on the Trump administration's efforts to slow thousands of Central American migrants arriving at the southern border. Today, we have a report on migrants who reach U.S. ports of entry only to be turned away and told to return another time. 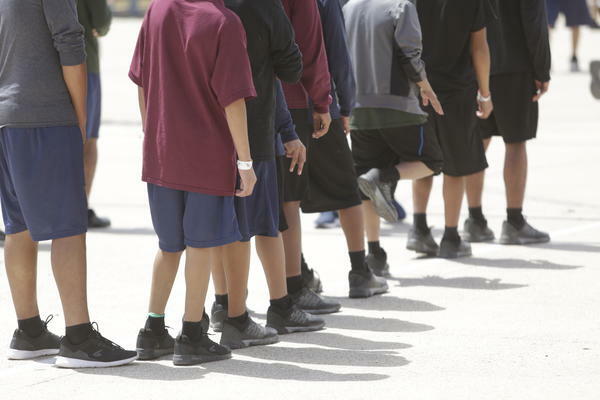 Immigration agents are stopping them before they enter the U.S. and request asylum. NPR's John Burnett is in the Texas border town of McAllen. He's been reporting on the administration's policies, and he's on the line now. Hey there, John. JOHN BURNETT, BYLINE: Hi, Audie. CORNISH: So we want to bring this story into focus a bit. And I understand that you have been following one family. They're journeying from Guatemala. BURNETT: Right. I was walking across the international bridge late Tuesday from Brownsville, Texas, to Matamoros, Mexico, and I noticed this big family that was sitting over at the side on a picnic table on the Mexican side. This was the Berduo family, and this is their story. CORNISH: All right, let's have a listen. BURNETT: There are nine of them from 58 years old to 9 months old. They say they arrived here from Guatemala the previous day. They say they tried three times to cross to the American side and request asylum, and three times immigration agents turned them back. In fact, now agents are stationed in the middle of bridges up and down the Mexico-U.S. border to stop asylum-seekers from stepping across the international boundary. VICTOR SAMUEL BERDUO: (Speaking Spanish). BURNETT: "We've been here on the border for two days asking for asylum, but the government won't pay attention to us," says Victor Samuel Berduo, the family patriarch, with an expression of resigned exasperation. "They tell us to wait or go to a different bridge, but we don't know any other bridges. If we go back home, they'll kill us," he says. BURNETT: And then in a gruesome show-and-tell, he presents his 23-year-old son, Wayner. His left eye is terribly injured, and a fearsome scar zigzags up the length of his right arm. His father says a drug lord sent two assassins to kill his sons one day last December. BURNETT: As he explains it, his boys make a living taking tourists to a place called the blue waterfall in northern Guatemala. But the narco owns the property and doesn't like visitors. BURNETT: His wife, Estafania, opens a plastic bag containing a stack of papers. One document has a seal that reads public minister. It urges foreign authorities to please help the family that's fleeing for their lives. U.S. Customs and Border Protection, which is in charge of the nation's border crossings, says it's overwhelmed with asylum-seekers fleeing domestic abuse and gang violence in Central America. Statistics show a nearly 60 percent jump in families asking for protection at ports of entry this year compared to last year, so agents stop migrants in the middle of the bridge and say there is no room in their stations for so many applicants. They tell them to wait in Mexico; come back later. But the agency says they're doing nothing wrong, and no one is being denied the opportunity to ask for asylum. Immigrant advocates believe this is just the latest obstacle the White House has thrown up to discourage asylum-seekers from coming. CHRISTINA PATINO HOULE: What we're seeing on the ground is that people are being turned away. They're being told that either there's no room, or they cannot enter the bridge. BURNETT: That's Christina Patino Houle, director of the Rio Grande Valley Equal Voice Network. She says the administration is giving a mixed message. Federal officials say if immigrants wade across the river and enter unlawfully, they'll be prosecuted, and families will be separated. Instead, they're encouraged to come through a port of entry. HOULE: A message is being broadcast across the nation that migrants should be seeking asylum through official channels, and it's just not possible. BURNETT: CBP says port of entry facilities were not designed to hold hundreds of people at a time who may be seeking asylum. Other bridges may be receiving hundreds daily, but at the Matamoros-Brownsville bridge, Mexican officials told me there are not that many asylum-seekers - 10 to 15 a day. They're mystified why U.S. agents say there's no room in their station. So the Berduo family decides to try again, and I follow. They pick up their bags and troop up the concrete walkway that spans the dark, sluggish Rio Grande. Two immigration agents in blue uniforms await them at the top of the bridge. UNIDENTIFIED PERSON #4: (Speaking Spanish). BURNETT: An agent asks for documents. Victor Berduo tells him they want to ask for asylum. The officers frown and call a supervisor when they see me and my microphone. The supervisor arrives. He's bald and wearing sunglasses. He examines their papers. He tells me to stop recording, or he'll stop processing them. UNIDENTIFIED PERSON #5: You can either stop, or we won't do anything. BURNETT: I'm on the Mexican side, Sir. UNIDENTIFIED PERSON #5: It doesn't matter. I'm trying to help them. UNIDENTIFIED PERSON #5: I'm actually trying to help them. BURNETT: Another agent gets a call on his radio. UNIDENTIFIED PERSON #6: Copy. We have room for one family. BURNETT: On the radio, they just said they have room for one family. The message is, we have room for one family but not nine people. The agents offered to accept the daughter-in-law and her two small children, but the rest will have to return to Mexico and wait. Tourists are passing with bottles of tequila and pictures of Pancho Villa, quizzically looking on as an anxious family conversation ensues. BURNETT: "We can't do it. We're one family. She always goes with us," Estafania says. The agents are adamant. They will only accept three now. Finally the family relents. Their daughter-in-law Jeni, with tears in her eyes, collects her children, a 9-month-old and a 2-year-old. The agent shoulders her pink backpack and escorts her into America. The six remaining Berduos walk back down the bridge to the picnic area to wait some more. BURNETT: "I feel like tomorrow, I hope they'll attend us, and our family can be complete again," says Victor Berduo. "That's what we want." CORNISH: That's NPR's John Burnett reporting from the international bridge between Matamoros, Mexico, and Brownsville, Texas. He's on the line now with us from McAllen. John, what happened to that family? BURNETT: Well, I don't know. They don't have a cellphone, and there's no way to reach them. I don't know if the remaining six were able to cross over and ask for asylum or not. CORNISH: If all of them - right? - if all nine were able to cross the bridge and ask for asylum, what's liable to happen to them? BURNETT: Well, there's a couple of things that could happen under the new Trump administration policies. First, the government may not even accept a claim that they're fleeing gang violence as a legitimate asylum request. And second, immigration officials could separate the parents from the children, which has been a huge ongoing controversy. CORNISH: Right. I mean, I understand that the Trump administration says that parents crossing illegally could be separated from their children. But there are reports that even families crossing legally - right? - presenting themselves for asylum are being separated. I mean, where are these kids going? BURNETT: Well, as it happens, yesterday, I took a tour of the biggest government contracted youth shelter in the country. It's in Brownsville. 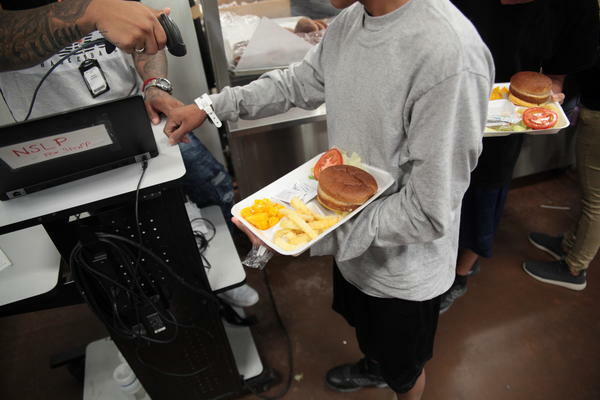 It's a converted Walmart Supercenter that's now a temporary home for almost 1,500 immigrant boys ages 10 to 17. It's called Casa Padre, and it's run by a Texas non-profit Southwest Key. There were teenage boys everywhere playing soccer and video games and in classrooms learning about American government and learning tai chi. They're fleeing violence, and so the shelter is safer than the environments they left behind. 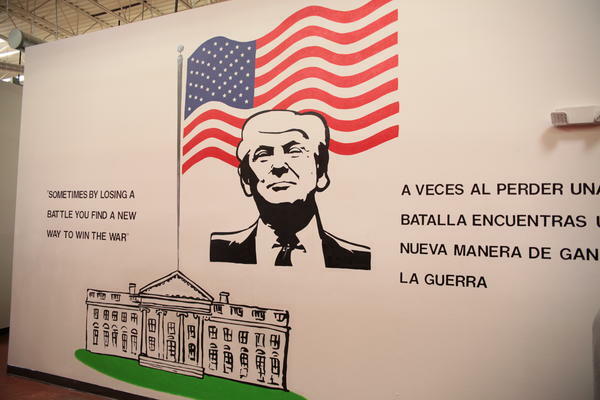 The walls are covered with murals of American presidents and lots of patriotic slogans. Most of the kids will spend about a month and a half here before they go to live with a relative or a foster family. But the thing is, as big as this sprawling shelter is, it's nearly full. 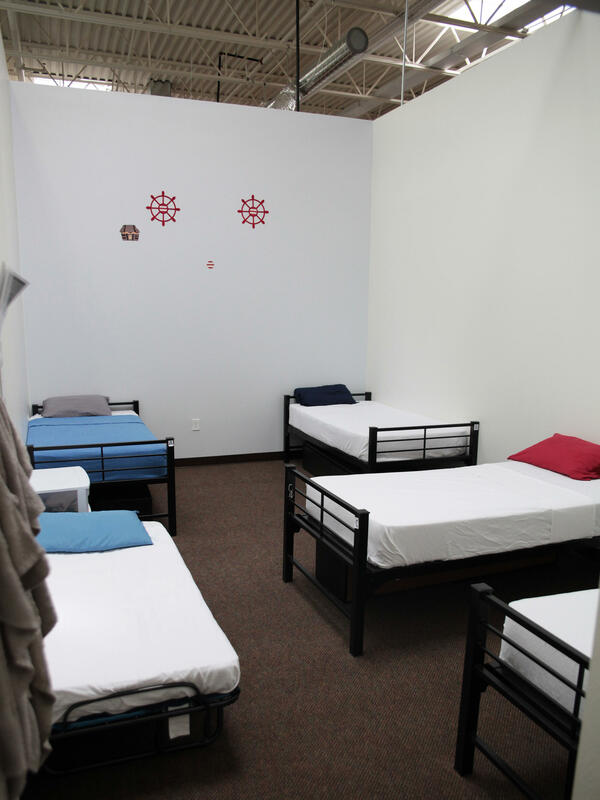 And all over the country, these shelters for minors are at 95 percent capacity. The kids keep coming across the border. So the government's looking everywhere for additional space, even on military facilities, which likely won't be near as nice as the shelter I visited. CORNISH: That's NPR's John Burnett. John, thanks for your reporting. BURNETT: You bet, Audie. Transcript provided by NPR, Copyright NPR.